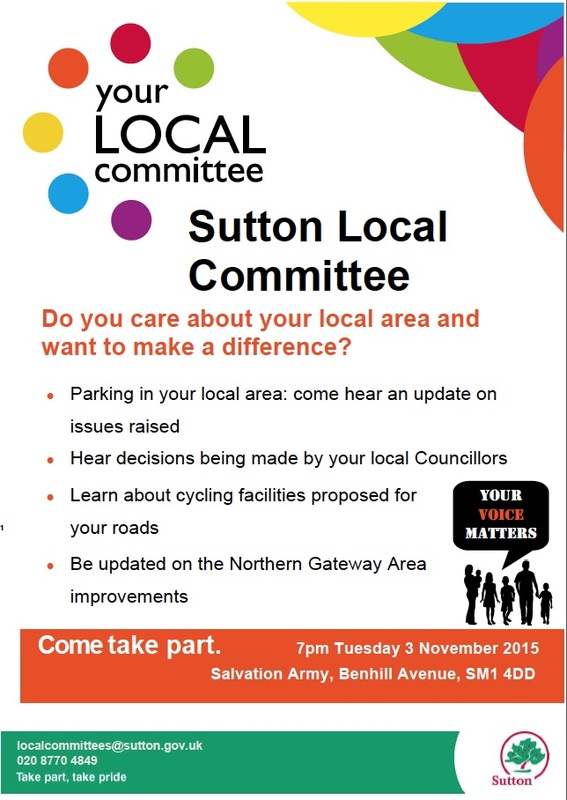 At the Sutton Local Committee meeting on 3 November, Councillors representing the Sutton Central, Sutton North and Sutton West wards agreed that proposals, which could ultimately see major upgrades to the cycle paths along sections of the A217 Sutton by-pass, be presented to Transport for London for consideration. Members of the Committee were responding to the report “Proposed Cycle Facilities on the Transport for London Road Network”, details of which are available from Major cycling schemes for TfL roads to be presented to councillors. This is the same borough-wide report that includes proposals for Rosehill roundabout, but which were rejected by the St Helier The Wrythe and Wandle Valley committee on 8 October. Following the presentation of the report by Lynn Robinson, Senior Engineer, Highways and Transport, Cllr. Wales, who had already shown his support for the Space for Cycling initiative last year, Cllr. Heron and Cllr Dombey all spoke in favour of the proposals. We are delighted that the Sutton Committee has effectively moved the debate forward, and hope that Councillors in the St Helier ward reconsider their decision on Rosehill roundabout. These proposals are just based on general principles, and no detailed designs have been undertaken. It is all subject to the availability of funding, and on TfL’s priorities. But it is a step towards Sutton becoming a much more cycle-friendly borough. There is a definite theme to the meeting this evening. I know that a lot of people are here this evening because they want to talk about problems with parking in their roads. I know for a fact that our borough, compared to other boroughs across London, has one of the highest levels of car ownership. Some of the reason for that is because actually if you want to get anywhere public transport is not very good.My husband was trying to get to Kingston the other day, and he decided he wasn’t going to drive he was going to do the right thing. So his options were either to sit on the 213 bus as it crawled through Cheam, Worcester Park and New Malden that would take well over an hour, or go by train. We tried every possible combination. It takes 17 minutes by train to get in to Wimbledon. That’s fine, and takes 12 minutes to get from Wimbledon to Kingston. The trouble is, you have to wait 29 minutes for the train from Wimbledon to Kingston, so in the end it takes an hour. So we have got an issue with connectivity. We have got an issue, not about getting into central London, but getting round London. Going to Bromley, going Kingston, going down south as well. So we have got to do something about it. And I think cycling has to be a very important part of that solution. Not everyone will want to cycle, that is absolutely fine. But we need to do everything possible to encourage people who are interested and able to cycle to do so. “We need to do everything possible to encourage people who are interested and able to cycle to do so“. So I had a look at this proposal and I actually walked along the stretch of the A217 that we are talking about and I was quite horrified to see the state that it is in. I am not a particularly fit and sporty person, but I am perfectly capable of getting on my bike and I think I would have really struggled to cycle down that cycle path. The tarmac is in very, very, poor condition. There is a lot of litter, and at certain points there are also cars parked. So I am very supportive of this scheme, and I think if we are serious about encouraging people to use their cars less – that is not stopping anyone – but it is actually encouraging people where they have that interest to use public interest and to use bicycles. I think we should do everything possible. I think this is a really good idea, and I am very supportive of it. This is very encouraging, and goes some way to help bolster the claim, made by Ruth in July, that the political will is there, now we need action. But the opportunity could have been taken to extend the perspective a little. For example, it would have been useful for Ruth to have focussed perhaps a little less on the idea of cycling to Kingston or to Bromley, and bit more on the fact that over 50% of car journeys in Sutton are less than 5 km (3 miles) in length. Speaking at the Sutton Cycle Summit in January 2014, Caroline Pigeon, Leader of the Liberal Democrat London Assembly Group, and Liberal Democrat candidate for the London Mayoral election in 2016, talked about the “great potential for cycling in the borough” and how “nearly 40% of vehicle journeys in Sutton could easily be made by bike” (in terms of distance and purpose, but less in terms of stress-free cycling). It would have been useful for Ruth to have taken the opportunity to mention that Sutton has the aim of becoming London’s most sustainable suburb (Sustainable Transport Strategy (June 2015)) and that part of this was about creating “the conditions that will encourage walking and cycling for shorter journeys including creating a less car dominated environment and making town centres more attractive for pedestrians and cyclists”. And it would have been an ideal opportunity for Ruth to have mentioned that the Council was about to publish a Cycling Delivery Strategy that will, if the draft strategy is anything to go by, talk about delivering a step-change in cycling in the borough. Residents who attended the meeting may have not taken a great deal of notice of what was said on this agenda item, or may have left thinking this cycling business was a one-off topic. I can’t help thinking that it would have been much better if they had left the meeting knowing that this was the start of a bigger longer-term vision for cycling. “and hope that Councillors in the St Helier ward reconsider their decision on Rosehill roundabout. “. Indeed, but having listened to the audio recording of that meeting and read the transcript it would be fair to say that our elected representatives did not ‘consider’ it at all. There was no discussion, no debate. It was just frivolously batted aside as if it were an irritant. I do hope that those who would like to cycle but are put off by lack of usable infrastructure are not considered to be an irritant. The St Helier The Wrythe and Wandle Valley Committee’s dealing with the agenda item at their meeting, held in public, on 8 October, wasn’t a particularly fine moment Gary, I agree. I take your point about hoping that elected representatives reconsider their decision, when it is clear that they did not appear to consider it the first place! At least, not at this meeting. Whether Members had discussed this prior to the meeting is not know. I suspect they had not. If they had, then one of the conclusions that I draw is that they thought this was a “scheme in progress” (and panicked – Rosehill roundabout being a contentious issue “of the moment”) rather than a “request that TfL consider their neighbourhood for a shed load of cash” (that could help alleviate many of the issues that are of concern now, so that things are much better “in the future”). Of course, the very idea that cycling could ever be considered a grown up form of transport for people to get to the shops locally, boost the local economy, reduce the traffic, the noise, take pressure off parking, and potentially make Rosehill District Centre a better place, appear to remain so far off the agenda that it hurts. Cycling is clearly still seen in some quarters as a marginalised activity, that is not worthy of investment. And while that remains the case, nothing is going to change. The Chair’s suggestion (made earlier in the meeting, during agenda item 6 Transport for London) that the thing to do at Rosehill roundabout is to (a) paint yellow boxes on the road surface so that people when driving will behave with more consideration, and (b) reinstall guardrailing to protect people from speeding traffic, speaks volumes. For the minutes to item 8 then include just one sentence “Members were not happy with the proposal for Rosehill roundabout due to safety concerns” is a disgrace. It seems to me that it would be more appropriate to say “Members turned down, “in the moment”, an opportunity that they appeared neither to understand or care about”. See, you have got me going again! However, I am pleased to say that the presentation and reception of the cycling report at the Sutton Local Committee last night, the subject of this post, was inordinately better. There will be updates here to include some of the very welcome comments from those present. I came away from the meeting feeling that we have turned a corner. I think that it is highly unlikely that we will have a repetition of what happened at St Helier. Clearly, there will be discussion and debate, but if the borough’s Cycling Delivery Strategy (expected at the end of the month) is the basis of that discussion and debate, there is potentially a lot to be positive about. I half expect that the ‘outcome’ (as opposed to the ‘decision’) on Rosehill roundabout will be rescinded too, but let’s wait and see.